I get asked a lot about my time working at SmartPak, but it’s been a long time since I worked there and I’m not really the best person to ask. However, that doesn’t mean that I want to leave y’all high and dry! Jessica is someone I met while working there, and she is one of the most professional, smart and driven people I’ve ever met in the work place – equestrian jobs or not. Of course she was a no brainer when I thought of my “people to interview” list, and I was so happy to get her answers for this series. 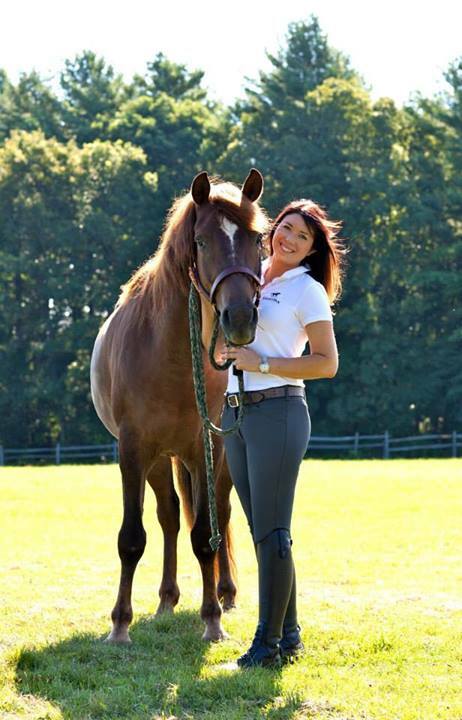 My name is Jessica Normand and my title at SmartPak is Senior Director of SmartSupplements. Basically, I oversee the product development and marketing of our private label brand of equine supplements, but I’m also highly involved in the extensive horse owner education initiatives at SmartPak, as well as with training our Customer Care team, and helping with our ColiCare program. So for us not working in the industry, SmartPak seems like one of those unicorn and rainbow jobs. What’s your favorite thing about working there? I hate to rub it in, but it truly is a unicorn and rainbow job… 🙂 I am grateful every day to work at such a cool place, getting to help horses, and that my coworkers are amazing people who have become my closest friends. Sometimes I have to stop and pinch myself that the little company I started working for over ten years ago has become such an amazingly successful business, and I got to be a part of that. Does working with horses day in and day out make going to the barn seem like you are still on the clock? Because I work in an office (granted, it’s a very atypical office with horse stalls for cubicles and about 40 dogs mixed in with the humans) I really get to enjoy my time in the barn. There’s nothing like fresh air, exercise and pony time after a long, intense day of sitting at a computer and rushing between meetings. And make no mistake – despite the unicorns and rainbows mentioned above, SmartPak IS intense. I think we get more done in one day than many companies get done in an entire quarter! 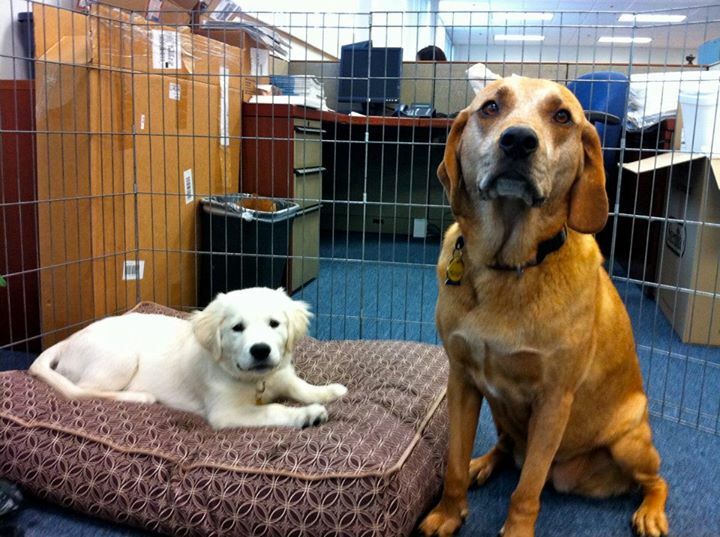 Note from Lauren: Dogs in office = awesome. I miss this so much! Jessica’s sweet Bailey pictured here to the right. What’s the coolest ‘perk’ you’ve experienced from working in an equestrian company? Favorite music playlist to review catalog layouts – go! Badass country chicks like Pistol Annies! Played really loud with a strong cup of coffee! 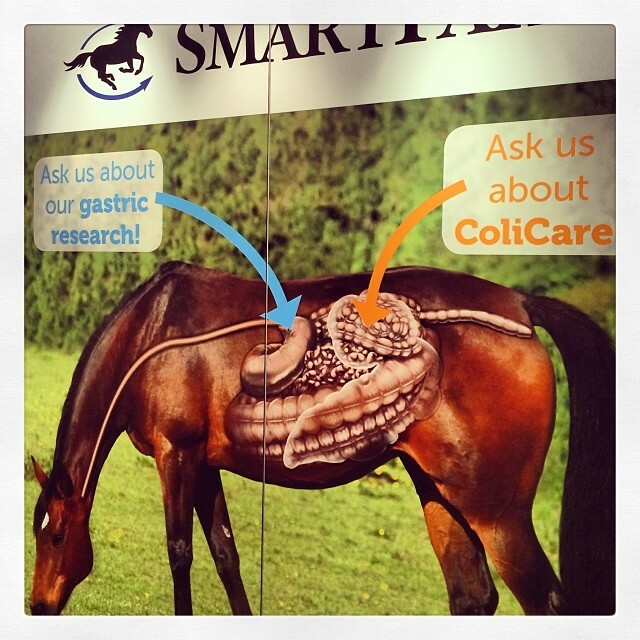 Before you worked at SmartPak, were you big into supplements? Interesting question… Since I started working at SmartPak as an intern back in 2002, supplements weren’t nearly as common a part of day-to-day horsemanship as they are now. But, that being said I did have an interest in them! In fact, I wrote a paper on oral joint supplements for horses during college, and was quoted in an interview my sophomore year as wanting to work for an equine supplement company (I was already stalking SmartPak at the time, of course). Outside of the office, you have an adorable little horse that I’m kind of obsessed with. Can you tell us a bit about Sawyer and why you chose his breed? Aww, thanks for asking about Sawyer! It’s kind of a long story, but here goes… When I was a kid learning to ride in Vermont I rode several “old type” Morgan horses. But when I transitioned to the hunter/jumper world as a teenager, I thought my Morgan days were behind me. Then I ended up attending UMass Amherst and the Morgan breed came back into my life again. And even though the government line Morgans at UMass were wonderful, I still didn’t think I was a “Morgan person”, and didn’t give the breed any additional thought after graduating. For my first 9 years at SmartPak I wasn’t able to have a horse of my own, though I did still ride other horses when I could. Finally I was able to free lease a young Thoroughbred from a family member. This mare was gorgeous, smart and athletic… But after a year of working with her, I realized she was a bit too athletic, if you know what I mean. She was really a professional’s ride, and I was finding myself too nervous to get on her without my trainer there to help. Eventually I got really honest with myself and realized that with my demanding work schedule and definite “adult amateur” level of bravery/athleticism, she wasn’t the right horse for me. Luckily she was able to go back to my family member’s farm, and I took several months off from horses. him in that Sunday night, it hit me… I wanted a MORGAN. I literally laughed out loud that this breed had come back into my life yet again. 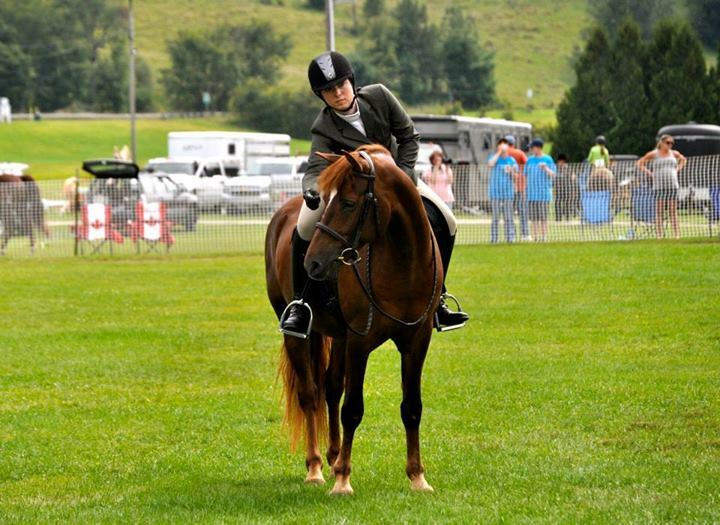 From there I threw myself into researching the breed and realized that what I wanted was a Lippitt Morgan – the true “old type”, with the most bloodlines tracing back to Justin Morgan, not the newer show type that has been crossed with Saddlebred lines. From there I started following The Lippitt Club on Facebook, and found Sawyer’s sale posting! He was bred in Wisconsin, and I flew out there to meet him on January 2, 2013! He was an un-started 4-year old with the bloodlines, personality and “type” I was looking for. He arrived in Massachusetts in late March, and my trainer and I had him started under saddle within a couple of months! He’s been a dream of a young horse, and wewere even able to attend the Lippitt Country Show in Tunbridge, Vermont, where he was Grand Champion Gelding in hand, and we won the Adult Walk/Trot high point at his very first show. This winter he’s having some time off, but I can’t wait to get back in the saddle after the holidays. My goals are to do some competing in dressage, to enjoy hunter paces and lots of trail riding, and to teach him to drive! 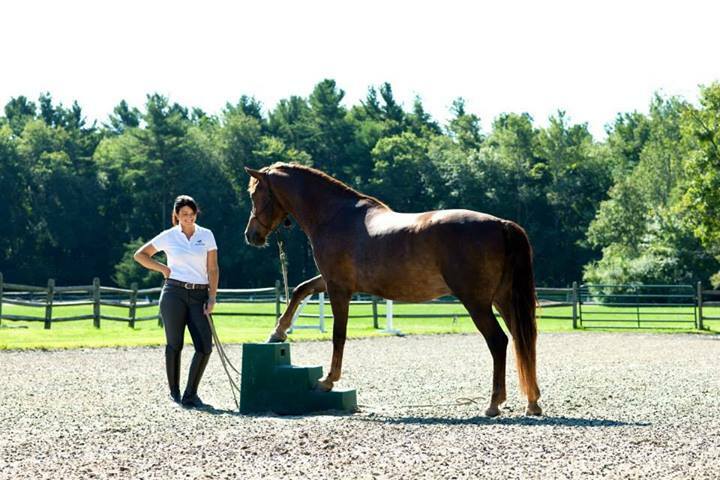 I can’t say enough about how wonderful Lippitt Morgans are… If you’re looking for your next horse and what I said above resonates with you, I encourage you to check them out! Every job, regardless of content, has its rough times. What helps get you going through the late night deadlines and makes it all seem worth it? What advice do you have to a college student or working professional who wants to work at an equine focused company like SmartPak one day? I get this question often from college students… My best advice is do what you love and always follow your heart. If you are passionate about your work, it will never feel like work, and you’d be amazed by how the right pieces will fall into place. I can’t give a specific answer about how to get in with an equine company that’s as successful as SmartPak, because there aren’t very many of them out there! If you’re interested in horse health, consider studying equine nutrition, as this field is evolving. But also read business books and consider business school, because the horse world needs more savvy business people who also love and know horses. Whoo hoo! I love smartpak! Great post and great questions! Just a teeny bit envious of puppies at work. I think that would make all jobs more bearable. Besides the discount, I probably miss that the most. There’s a waiting period so it’s not like you can bring your dog automatically when you start, but even going to visit your “neighbor” dogs is super awesome. Plus I was lucky enough to be able to bring my dog towards the end of my time there, and I just loved it! Ha! I was scrolling down and saw the photo at the fairgrounds and thought, “Hey, that looks like Tunbridge,” and I was right! Such a great space. They also do the Vermont Morgan Heritage Days, which has classes full of Morgans all weekend. I’ve said for years that my next horse will be a Morgan. There’s a reason they are so popular. Wonderful little horses. Beer on Fridays… yeah that sounds awesome! Beer on Fridays and dogs at work??? It is def rainbows and unicorns! I love SmartPak! Great interview. I would give anything to have my dogs at work. Sigh, I am so jealous of this amazing job. Sounds like the best place to work! What a great interview! It’s awesome to know that a company that has such good customer service does a great job treating their employees well! Such a great interview! I love Smartpak! Awesome questions/answers. Definitely jealous of the dogs at work. I work at a vet’s office and I still can’t bring him! 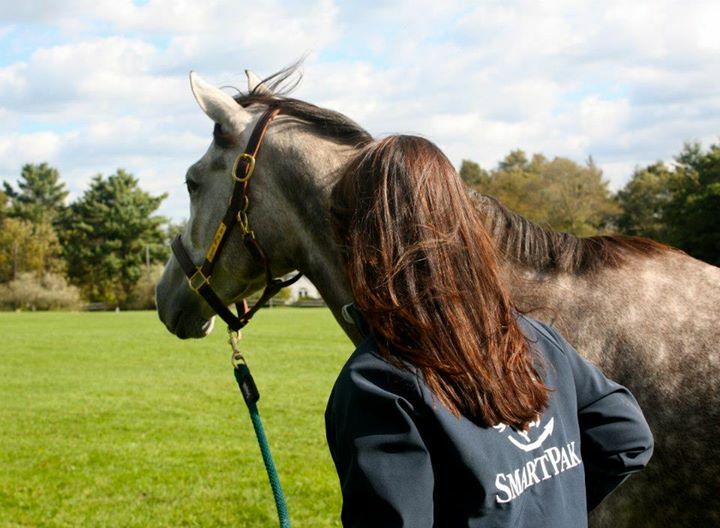 I didn’t think that it was possible to love SmartPak even more, but now I do! My cousin works there, and I’m so jealous of her. Love this interview with Jno! Great interview! What a wonderful service you are providing to highlight equine jobs for college students! Great interview!! Everyone should be so lucky as to have a “unicorns & rainbows” job! Good for you for following your passion!